It seems to be an Immutable Law that beer has an inferiority complex about its relationship with food. Inferior, of course, to wine. In the late ‘80s, Michael Jackson used wine as a comparator to help people understand the breadth of beer styles around the world – a clever trick as comparison and copying is how we make sense of the world right from our formative years. So it was remarkably successful but with unintended consequences. The main one is that the same comparison – a comparison with wine – is a tough one. Wine & food has decades of normalisation, decades of unchallenged drinker acceptance, and decades of reinforcement by media, restaurateurs and word of mouth. I protest too much. Beer need not worry: the breadth of beer styles, the flavour variations that come from the grist, the hops, the fermentation, maturation, the carbonation, and the interplay between these, mean beer should be confident. There are as many breathtaking food partnerships for it as for wine. Let’s rejoice and move on. Breathtaking partnerships brings me back to the subject of ‘kickers’¹. The magic in a chat over a pint arises from that combination of slowly-slowly inebriation (that only a high volume, low alcohol product can deliver); the beer itself: its tastiness, its presentation; and the kickers – the chaperones of the beer experience. We have a couple of great pubs near me; one is a local CAMRA award winner, but another does amazing kickers – in fact, in our socially responsible times, they don’t run a ‘Happy Hour’ with discounted booze but offer free kickers instead, a nice range, nicely presented, simply put out on the bar. Hands down winner. To my mind, if the kickers are great there’s no need for a meal. I’m going to eat them anyway, and if they’re good quality, why hold back? So recently I’ve been pushing the boundaries to discover new combinations. And pickles are the latest discovery: pickles as in chutney, and pickles as in whole pickled veggies as an American might say. Not just pickled veg neither – pickled fruit too; even a – whisper it – pickled egg perhaps? (There’s a kicker in need of a rebrand if ever I saw one). Look out for them, pickles are the accompaniment of choice in food telly land at the moment, so presumably in the real world too. Barnsley Chop with Pea Mash and Pickled Beats. Pork Belly with Pickled Baby Veg and Crushed Jersey Royals. But pickles deserve to be more than mere accompaniments and with beer they make surprisingly great kickers. In our Summer Retreat in Mallorca, the Tinted Family enjoyed a glass or three of pale beer that were served with gherkins (Cornichons? What’s the difference?) and pickled roasted tomatoes. The latter were a jaw dropping combination: tomatoes, despite their ubiquity can be tricky buggers to pair with, but this was a riveting success, with smokiness, tartness and sweetness rolled into one. It was an ironic shame that the beer was quaffable but bland. It has sparked pickling madness: Kilner Jars are being acquired on ebay. Unusual ingredients are being snuck into the shopping basket. Questions are being asked about why we need industrial quantities of white wine vinegar. But the real revelation is that you can pickle with beer (forgive me if I am slow to the party!). I have some refrigerator pickles maturing now that feature a malty glug of aged White Shield. And this weekend saw a chutney being concocted featuring another White Shield Brewing Company beer – ‘E’. Fresh from the pot, it was spicy and sharp but with a rich, chestnutty smoothness that comes from the beer, whilst the spices still ring through. The rest is now sitting in the cellar, maturing nicely with any luck. Next weekend features refrigerator pickles, ideal to be eaten straight with a glass of pale ale, or porter perhaps. If I sound surprised by all this, I suppose I shouldn’t; surely it’s natural that a fermented product should sit well with another? So when you have a small dish of smoked pickles to accompany your pint next time, remember. You heard it here first. 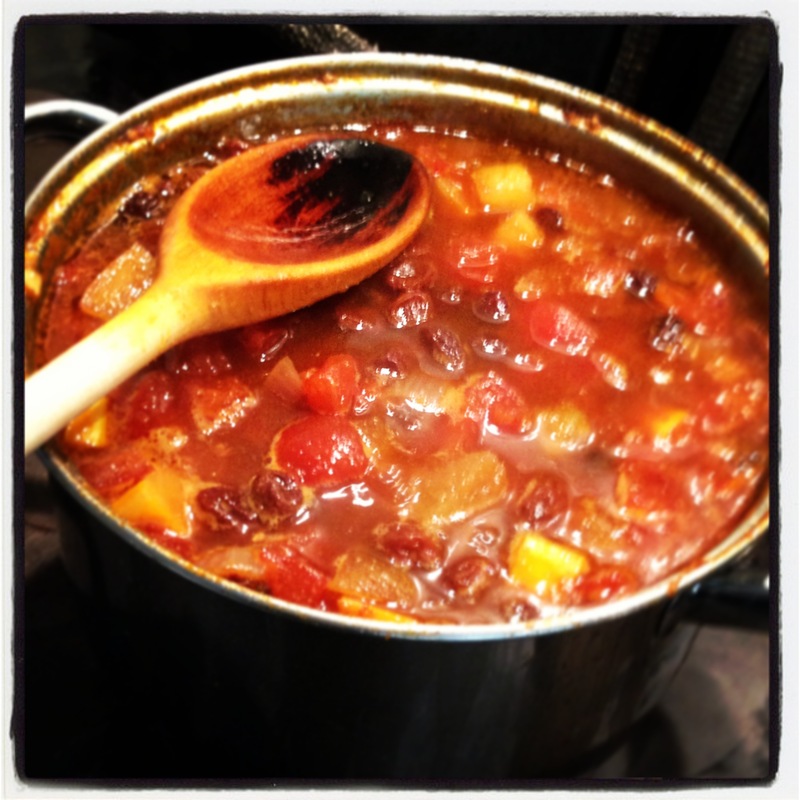 Worthington ‘E’ chutney with roast tomatoes, red onion, raisins and squash. It may not be a looker, but by heck, it’s a taster. This week’s final heat on the Great Beertish Menu featured chefs from the South West. I love the South West. I went to University there and now have family in the region – but it’s the incredible variety in the landscape that’s in my soul. From the windswept moors and their bewitching rock tors that hover, almost suspended in mid air on misty mornings, to the deep, riven valleys, cutting narrowly and steeply into the sea, and the surprises too… like the parallel valleys and ridges of east Devon that rise and fall as if the ripples of the sea have set on land. And undoubtedly my positively coloured view impacted how I viewed this week’s Great British Menu. “All the chefs seem much more chilled, and they are all being pleasant to one another. It must be living in the South West that does it. I bet they all go surfing after work”, I was telling myself…. although none of the chefs had much of a West Country burr in their accents though so it was definitely a case of beer tinted specs on this job. Of the three cheffy protagonists, two had competed before. One, Paul Ainsworth, got his pud through to the final last year and this year yet again delivered incredible, thoughtful and creative presentation…plus clearly, flavour too. Yet gratifyingly, Nathan Outlaw ultimately won it, for his beguilingly simple dishes; so simple, they disguised the innate technical complexity and subtle combinations of flavour. And I say gratifyingly because at his restaurant in Rock, Outlaw has been working with Stuart Howe of Sharp’s Brewery on innovating with food and beer. It seems fitting therefore to pair his winning menu with some beers. Starter: Hogs pudding with seaweed, potato terrine and mushroom ketchup. I remember Hogs pudding from when I lived in the south west, At Uni, they used to serve it every Friday breakfast. Consequently, I didn’t have it there that often as I rarely made it up at such a ridiculous time (9am), but when I did, I always had it. I think it was made by Ivor Doble in town and had this subtle yet peppery taste plus a smooth, deeply milled texture. For me, this needs a beer with nuances – ideally from a bit of aging. 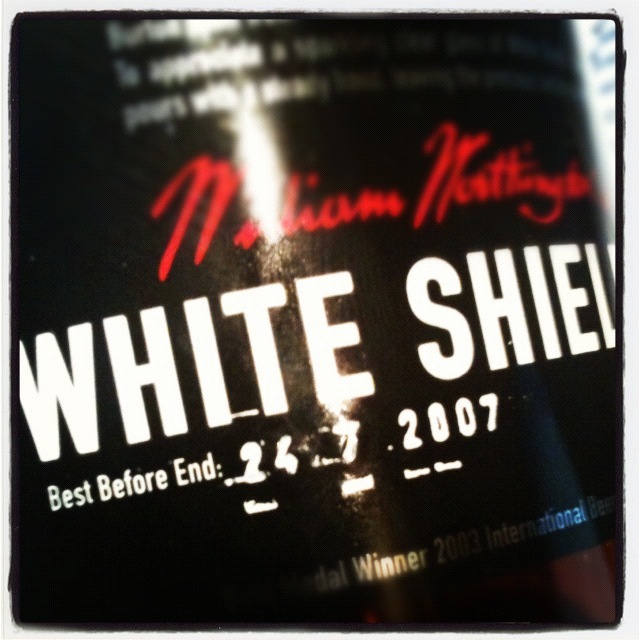 I’m going to kick off this menu with a good bottle of Worthington’s White Shield, buy it from Morrisons and get it close to sell by if you can, then ideally leave it at least another 6 months. Described as having a ‘chestnut sparkle’ whatever the hell that is, this is beer that gets sophisticated with age. It does have a lovely conker colour right enough, but I feel could handle a little bit more yeast dosage to give it the greater ‘sparkle’ it used to have. Fish Course: mackerel again, this time with horseradish and oyster sauce. This dish split the judges but was presented fabulously, despite an accusation of being ‘beige’. The humble mackerel seems to be quite de rigeur at the moment, and it has now featured on a number of winning menus. And when combined with horseradish needs a beer with a willingness to fight and stand up for itself. There’s a lot of flavour going on here but I think a beer that can handle it will be Veltins. I think of these west German lagers as like chablis – steely and precise – and good with fish of all denominations. Main: duck, barbequed monkfish, rosemary, samphire and aspargus. My friend Paul describes dishes like this as ‘Surf and Turd’ after he had a run of bad experiences in Texas when he was working out there. But I get this one; monkfish has that bovine-like compact texture and structure, yet a delicate flavour; the ‘barbeque’ sauce wasn’t what we perceive it to be but a much more herb-laden marinade that brought the two cuts together. And for me, a bottle of Sol or Corona for BBQ just won’t cut it. You need some body here, and whilst I am loathe to recommend a beer that is so hard to get hold of in the UK, I think Orval would be a cracker – again, give a bit of age on this beer as it can change remarkably with time. Orval is a Trappist beer that flys like a butterfly and stings like a bee; it has the suppleness to complement this meal, yet a left hook that lets you know that there is another boxer in the ring. Pud: elderflower and lemon tart, strawberry sorbet and meringue. This dish didn’t go down that well, so don’t expect it to be gracing the innards of any Olympians soon, however, it was very pretty and nicely executed. And Vedett Extra White would be a lovely accompaniment to this dish – Vedett’s wit beer is fairly new and unlike some other Belgian beers of this style doesn’t have an overpowering cloviness. It’s more finessed yet still has sufficient bitter zing to show off elderflower and stand up to flavours like strawberry. 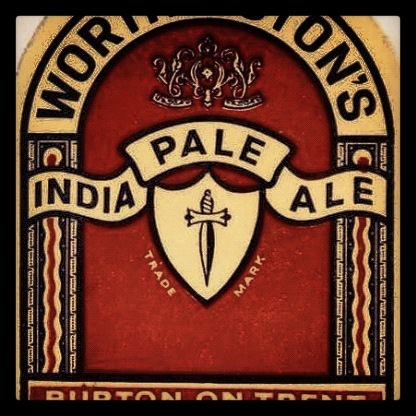 Onwards and upwards: next week the grand finale – let’s see if a great British beer can win gold on the final menu, or whether the final medal table will be dominated with New World boldness.